How would you describe your SKIPP Project experience? I really enjoyed the series. It was an eye opening experience and extremely inspiring. I definitely learned a lot of information about various organizations and met the people who deal with childhood injury prevention. It was great to see and hear others’ perspectives on the topic. It was also a great networking opportunity. Our minds were opened to new ideas. The whole experience equipped me with more information than I had and motivated me to do my own research on more ways to help children and young parents. 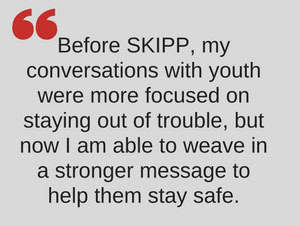 Why did you participate in SKIPP? When the opportunity was mentioned at a SKIPP networking event, I was very intrigued because it sounded really different from any other training. I work with children who have committed crimes in the community. We are trying to prevent them from making more mistakes. They’ve made some bad choices and we are helping them find their way. So, I wanted to learn more about childhood injury prevention and how I could provide families with skills to keep them safe. How do you plan to use what you learned? We received a wealth of information, and I’ve used some of those strategies to approach my families in a different way. I find myself stressing the importance of safety more frequently with families. Additionally, I’m able to explain to them some of the common causes and types of childhood injuries in our community. As an example, if children are skipping school, they might get in a car with someone who doesn’t have a license. Or they might be walking in the street, and anything can happen. Instead of only focusing on the trouble they’ll get in for missing school, I am more likely to talk to them about how easily they could get hurt, end up in the hospital or worse. I think the information I share can reach more than just the children who I deal with directly - their siblings and the whole family might benefit from a safety suggestion or resource. I also work with some young parents, and now I am able to give them good information and recommend classes for them. 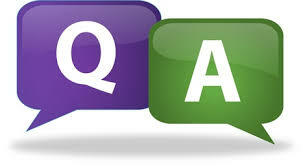 For example, I’ve passed along information for child care and parenting classes that are online as well as at WakeMed. Since the SKIPP program, I’ve also recommended babysitting classes to older children who are frequently left to care for their younger siblings or for those who are pursuing babysitting opportunities. They need to learn how to really take care of a young child and keep them safe. Thankfully, I can pull from resources that I have received from some of the other SKIPP participants. What changes do you see happening in our community that are preventing and/or reducing childhood injuries? Two colleagues in my department, who also participated in SKIPP, recently spearheaded a new program in collaboration with Haven House Services to start an all girls program called HALO (Helping Adolescent Ladies Overcome). It is a court-ordered program that is geared toward helping young women become more aware of their peers, bullying, preventing human trafficking, safe dating and many other things related to childhood injury prevention. How would you like to see others engaged around the prevention of childhood injury and what ideas do you have for engaging others? Many times young parents don’t understand the responsibility of being a parent. They need breaks but don’t have a lot of support so they might leave their child with someone they don’t know very well. I’d like to see some groups work together to offer a program to help young parents make better decisions. One idea would be to somehow set up a hotline for young parents to call when they are stressed out or unsure of where to turn for help. See the view point of other SKIPP training participants. Funded through the John Rex Endowment’s preventing injury goal, the Skills & Knowledge for Injury Prevention Partners (SKIPP) Project provides networking and no-cost training opportunities to increase knowledge of injury prevention and to ensure that efforts are effective in creating safe environments for children.